Telangana:13/12/18:TRS supremo K Chandrasekhar swore-in as chief minister of the state for the second time at 1.25 pm in Raj Bhavan. 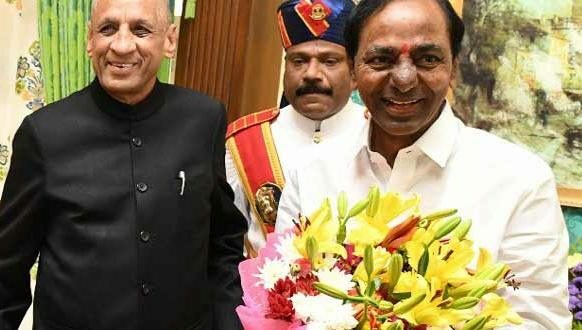 The governor ESL Narasimhan administered the oath to KCR and the ceremony began with the national anthem.KCR took the oath in Telugu for the chief minister of Telangana. After KCR, Mahmood Ali took the oath in Urdu as deputy chief minister of Telangana. The ceremony has concluded with the national anthem.The ceremony was held in the presence of family members of KCR and Mahmood Ali, MLAs, MPs and others. After the ceremony, KCR headed to Pragati Bhavan to hold a meeting with the party leaders.